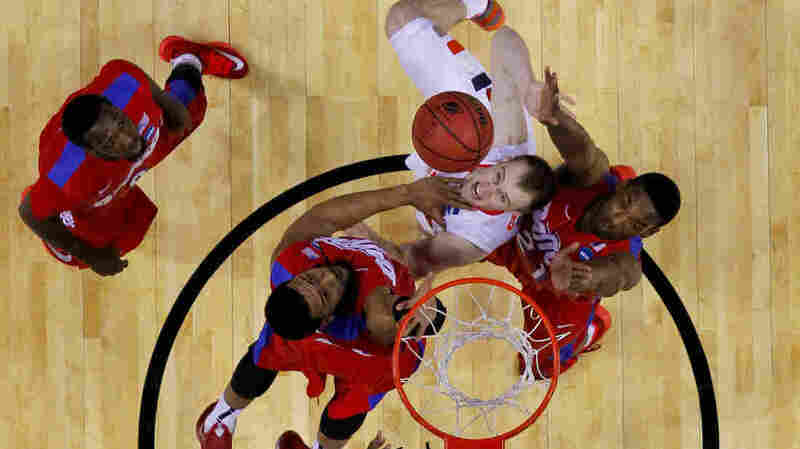 Nation's Last Known Perfect Bracket Busted By Syracuse Loss : The Two-Way Brad Binder had called the stunning Duke defeat. But when Dayton surprised Syracuse with a 55-53 upset, what is thought to be the last perfect bracket in the U.S. went up in flames. We told you about how some stunning upsets in the men's NCAA basketball tournament ended the billion-dollar dreams of those who entered Warren Buffet and Quicken Loans' "Billion $ Bracket Challenge." We also told you about Brad Binder, 23, of Buffalo Grove, Ill., who up until Saturday afternoon had the last known perfect bracket in the country. It meant that Binder turned wizard and predicted that No. 3 Duke would fall to No. 14 Mercer very early in the tournament. Binder also predicted that No. 11 Tennessee would beat No. 6 UMass. Despite his knack for predicting the surprising future, Binder did not enter the Quicken challenge, which meant he got lots of media attention that sounded a lot like this headline from the Huffington Post: "The Last Guy With A Perfect Bracket Blew His Chance To Win $1 Billion"
But late on Day 2 of the tournament, No. 11 Dayton sent No. 3 Syracuse packing.